Sienna (Siena in the Italian spelling) is situated on three gently rising hills in central Tuscany, Italy. The Siennese are said to speak the purist form of the Tuscan dialect which, at the unification of Italy, became the national language. Sienna is quite rightly extremely popular with tourists but because it is a town and not a village like San Gimignano, for example, it usually does not seem excessively crowded. 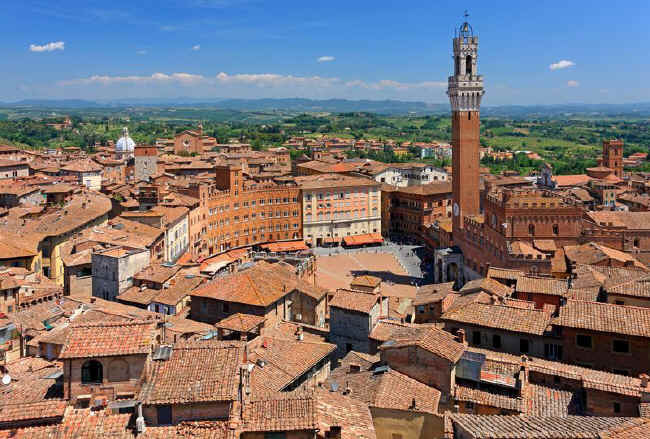 The fine piazza, magnificent cathedral and museums, as well as the twice yearly palio and the interesting folk culture associated with it, make Sienna worth intensive study. Siennese painting and architecture of the Renaissance and later is second in importance only to that of Florence in the history of Italian art. Klicken Sie hier um alle wichtigen Informationen zum Chianti und die dort verfügbare große Auswahl an wunderschönen Gutshof-Apartments und Ferienzimmern zu sehen. The Academy of Fine Arts, the museum of the Cathedral and the different churches of the city, almost completely illustrate the history of art in Sienna. In no other city did art, especially painting, have a more local character, and nowhere else did it remain so conservative. Italian Gothic architecture reached a peak here, among both ecclesiastical and in civic buildings, and the work of Siennese architects may be seen beyond the confines of their state (e.g. the cathedral of Orvieto). Sculpture received its first impulse from Nicolo and Giovanni Pisani, whose Siennese disciples carved the decorations of the facade of Orvieto cathedral. The most renowned sculptors of the 15 C were Jacopo della Quercia (1374-1438), one of the pioneers of the Renaissance, Lorenzo di Pietro, Antonio Federighi, Francesco di Giorgio (also an architect), Giacomo Cozzarelli and Lorenzo Mariano. Sculpture in wood is represented by the brothers Antonio and Giovanni Barili, Bartolomeo Neroni, and others. In painting Sienna possessed in Duccio an artist who surpassed his contemporary Cimabue of Florence, both for grace and in accuracy of design. Nevertheless, art developed and was perfected in Florence more rapidly than in Sienna. Simone Martini (1285-1344), immortalised by Petrarch, and a citizen of Sienna, bears comparison with Giotto. Lippo Memmi (also a miniaturist), Pietro and Ambrogio Lorenzetti, imitated with the composition of the school of Giotto. But Bertolo di Fredi (1330-1410), Taddeo de Bartolo (1360-1422) and the 15 C painters, Domenico di Bartolo, Sano di Pietro, Vecchietta, Matteo and Benvenuto di Giovanni, compared with the Florentines, seem almost mediaeval. Sienna therefore turned anew to Florentine, Lombard, or Venetian painters, under whom the ancient fame of the city revived, especially in the works of Bernardino Fungai, Girolamo della Pacchia and others. The most renowned representatives of the Renaissance in Sienna are Baldassare Peruzzi, better known as the architect of the Basilica of San Pietro, Giovanni Antonio Bazzi and Il Sodoma (1477-1549), a rival of Raphael. The decline begins with Domenico Beccafumi (1486-1551). In the 19 C, Paolo Franchi founded a school of painters closely related to the "Nazarenes" (a group of German painters of the early 19 C, who imitated the Italians of the 15 C and early 16 C). The chapel of the Istituto di Santa Teresa gives a good idea of their art. 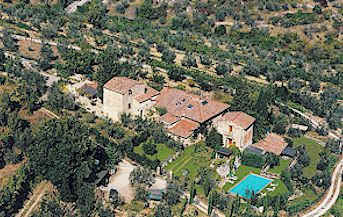 Vacation apartments in Torniella, convenient to Sienna and the Maremma. Ideal for groups of up to 12 persons. Lockable bicycle garage available. Holiday apartments for 2 to 6 persons. Both apartments may be rented together with additional rooms providing accommodation for groups of up to 12 vacationing together. Click here for more about Casa Reasco. The Cathedral of Sienna is said to occupy the site of a temple of Minerva. The present building was begun in the early 13 C and the cupola was finished in 1464. But in 1339, it was decided to so enlarge the cathedral that the area then occupied by the nave should form the transepts of the new building. In fact the construction of the longitudinal nave, now in part incorporated in the Opera del Duomo, was actually commenced. Though the plague of 1348 compelled the citizens to abandon this plan, they determined to complete the original design in a worthy manner. As it stands, the building is about 292 ft. long and 80 ft. wide — 168 ft. in the transepts. The facade is decorated with bands of red, white and black marble, tricuspidal, and richly adorned with sculptures (restored in 1869) and with mosaics (renewed in 1878). In the interior, the pavement is of admirable marble mosaic — the work of masters of the fifteenth century, which has been for the most part renewed. The pulpit, entirely in relief, is the work of Nicolo Pisano and his pupils. The high altar is by Petruzzi, the bronze tabernacle by Vecchietta, and the carvings of the choir by the brothers Barili. The chapel of San Giovanni contains a statue of the saint by Donatello, together with statues by other sculptors and frescoes by Pinturicchio. Scattered through the interior of the cathedral are statues of Sienese popes and the tombs of the bishops of Sienna. The library of the cathedral possesses ancient choir-books and other manuscripts, and is adorned throughout with frescoes by Pinturicchio representing scenes from the life of Pius II — the gift of Pius III. In the centre of the library is the celebrated group of the Three Graces, presented by Pius II. The remains of the exterior sculptures and of the pavement of the cathedral, as well as paintings and sacred tapestries, are preserved in the Opera del Duomo. In the Hospital of Santa Maria della Scala (13 C), the church and the pellegrinaro (a large sick room) with frescoes by Domenico di Bartolo are noteworthy. San Agostino possesses pictures and frescoes by Perugino, Sodoma, Matteo di Giovanni and others. Beneath the choir of the cathedral is the ancient baptistery, now the parish Church of San Giovanni, with its remarkable font, ornamented with sculptures by Quercia, Donatello and Ghiberti. The archaeology of the site of the Hospital has been intensively researched and some speculative but informative reconstructions of the site at various times have been published by the University of Siena. In Santa Maria del Carmine, the cloisters and the Chapel of the Sacrament are particularly interesting. The Oratory of San Bernardino contains works of the principal Siennese artists, especially of Sodoma and Beccafumi. The house of St. Catherine of Siena (Benineasa) has been transformed into a number of chapels. San Domenico (1293) possesses pictures by Sodoma, Fungai, Vanni and others, and a tabernacle by Benedetto da Maiano. The little church of Fonteguista has frescoes by Fungai, Petruzzi, and Lorenzo di Mariano. Scattered throughout the other churches are works of the 14 and 15 C.
Outside of the city is the Convento dell' Osservanza, with majolicas by Andrea della Robbia and paintings by Sodoma, Sano di Pietro, Taddeo Bartolo, and others, and the cell of St Bernardino of Sienna, and the tomb of Pandolfo Petrucci. More distant from Sienna are the Certosa di Pontignano, the Abbey of Sant' Eugenio (730), and the monastery of San Galgano (1201). Civic buildings of great interest are the Palazzo Pubblico (1289), with the Torre del Mangia (102 metres), at the foot of which in the form of a graceful loggia is the Capella di Piazza (1376-1460), adorned with frescoes and sculptures. In the interior of the Palazzo Pubblico, the halls of the ground and first stories (Sala della Pace, del Mappamondo, di Balia) are decorated with frescoes by painters named above and by others; the frescoes of the Sala Vittorio Emanuele are modern (Maccari and others). 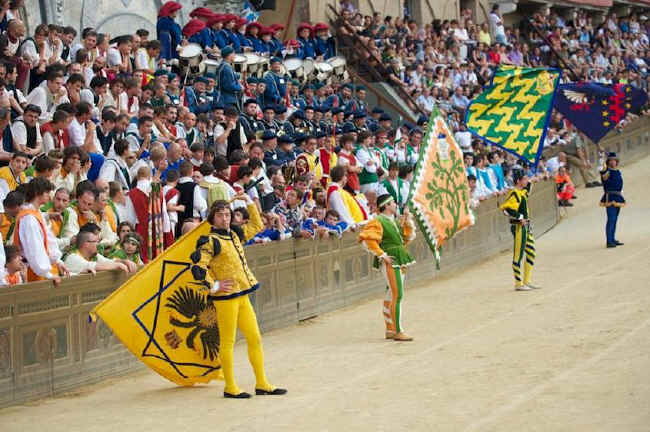 In front of the Palazzo Pubblico extends the great Piazza del Campo, where on the second of July and the fifteenth of August of each year the celebrated horse races are held — Corse del Palio. The Fonte Gaia (Joyful Fountain) in the public square is the work of Jacopo della Quercia. Among the private palaces the following are of note: Spannochi, Casino de' Nobili, Tolomei, Buonsignori, Piccolomini (the last named contains the public archives) and Palazzo delle Papesse. The Monte dei Paschi is perhaps the oldest bank still in operation. It was founded in 1472, and was reorganized in 1654, when the pastures (paschi) of the Maremma, from which it derives its name, were assigned to it as securities. In ancient times the Etruscan city of Saena was apparently of no great importance. Although the remains of the Etruscan and Roman periods are rare, recent excavations have brought to light the remains of a quite substantial Etruscan structure, suggesting that a re-evaluation of the importance of Siena to the Etruscans might be called for. Saena became a Roman colony under Augustus. Under the Lombards, Sienna was the seat of two gastaldi (magistrates), one a judge and the other a minister of finance. Under the Carolingians, Sienna transformed into a city state which in 868 became a hereditary possession of the family of Vinigiso Ranieri, who soon divided the territory among their various branches. The power of the bishop increased in consequence, so that, in the 11 and 12 C, he was the sole ruler of the city and the surrounding territory, though he recognized the over-lordship of the margraves of Tuscany. By the time of the death of Matilda (the last Countess of Tuscany, 1115), a municipal government already existed, and in 1125 consuls are first mentioned. Thenceforth the form of government changed continuously. In the beginning there were three consuls, later there were twelve, the office being restricted to members of noble families. At other times a dictator was named. Through donations, purchases and conquests, particularly from various petty lords of the Maremma who were forever plotting against Sienna, the territory of the republic increased. In its expansion, Sienna naturally conflicted with Florence. Thus in the struggle for Poggibonsi (1141) the Siennese won, but were conquered by the Florentines in 1445. The rivalry with Florence consequently determined the politics of Sienna, which adhered to the imperial (Ghibelline) party. Nevertheless, in 1194 the Siennese repulsed the army of Henry VI, who failed to recognise the privileges accorded the city by his father. This victory increased the prestige of the republic, which now enlarged the circuit of its walls. In 1197 it joined the League of San Genesio. In 1199, the common people, wishing to participate in the government, secured the nomination of a podestà (chief magistrate) for justice and war, although the administration remained in the hands of the consuls of the guilds. A new change occurred in 1212, in which the administration passed to the Provveditori (purveyors) della Biccherna, while the consuls were reduced in rank to simple councilors. In consequence, the heads of government changed in rapid succession: the Twenty-seven, Twenty-four, Seventy, Thirty-seven. Meanwhile, at the battle of Montaperti (1260) Sienna, at the head of the Ghibellines of Tuscany, had humiliated the hated Florence. But in Sienna itself, the Guelphs, aided by Charles of Anjou, acquired sovereignty in 1277. Positions of power were all bestowed upon Guelphs, who for the most part were required to be merchants. Meanwhile the petty Ghibelline lords of the Maremma laid waste the territory of the republic, despite the mediation of Pope Nicholas III. The Guelph Government of the "Fifteen", instituted in 1282, lasted for seventy years. The war against the Bishop of Arezzo, head of the Ghibellines, who was defeated at Pieve al Toppo, occurred during this period. Internal discords among the principal families, the recurrence in Siena of the conflicts between the Bianchi (whites) and Neri (blacks), for which the city was excommunicated by Clement V, the seditions of the butchers, doctors and notaries, fomented by the nobles excluded from the government, failed to displace the Guelph merchants. It required the Great Plague of 1348, with its 30,000 victims in the city, and the advent of Emperor Charles IV to effect a change in the government. In 1355, the nobles and the common people rose in revolt and instituted a mixed government of twelve plebeians and twelve nobles with four hundred councillors. But this lasted only a short time. In 1368, three changes were effected, and the whole year of 1369 was characterised by revolts and slaughter. The arbitration of Florence was of little avail. To these tumults and constitutional conspiracies within the city was added (1387) the rebellion of Montepulciano, fomented by Florence. A war with Florence arose in consequence, in which the Siennese had as an ally Gian Galeazzo Visconti, proclaimed Lord of Sienna in 1399. But in 1404, they deserted Visconti, made peace with Florence, to whom Montepulciano was abandoned, and constituted a new government. From 1407-13 Sienna was repeatedly assaulted by King Ladislaus of Naples, because of its adhesion to the "Conciliabulum" of Pisa. In 1480, with the occurrence of new tumults over the right to participate in the government, Pandolfo Petrucci acquired the upper hand, and in 1487 instituted a new and absolute government. Caesar Borgia secured the expulsion of Petrucci from Sienna, but in 1503 the latter returned, assumed the title of Magnifico (Maecenas of the Arts), and was more powerful than ever. His son Borghese Petrucci, who succeeded him in the signoria, was expelled in 1516 by order of Leo X, who intended to subject Sienna to the Medici. Hence the enmity that Cardinal Alfonso Petrucci bore him. Clement VII was on the point of proclaiming the Medici as rulers when the victory of Pavia (1525) and succeeding events destroyed his hopes. The Spanish protectorate proved even more severe. Charles V wished to compel the Siennese (1550) to construct a fortress for the Spanish garrison, whereupon they sought the aid of France, which sent a garrison of its own, so that the Spanish and Florentine troops abandoned the city. But Cosimo de' Medici was unwilling to relinquish his prey. Indignant because the command of the garrison had been given to Pietro Strozzi, a Florentine rebel, he invaded the territory of the Republic in 1554, and after several successful encounters, laid siege to the city, which surrendered on 17 April, 1555. Montacino, Chiusi and Grosseto maintained themselves for a few years longer, but in 1559, under the terms of the Peace of Cambrai, the French troops departed. Thus the Medici acquired finally the large territory now divided between the Provinces of Sienna and Grosseto. Orbetello alone was given to Spain. The Siennese soon accommodated themselves to the new regime, which left them much autonomy. Among the renowned natives of Sienna and its environs were the Popes Alexander III, Pius II, Pius III, Alexander VII, the hermits St. Galgano (1181) and St. Giacomo (11 C), St. Catarina Benincasa, St. Bernardino Albizzeschi, and St. Ambrogio Sansedoni. The heretics Socinus and Ochino were born at Sienna. As first apostle of the Christian faith, Sienna venerates St. Ansanus who suffered martyrdom under Diocletian. Bishop "Florianus a Sinna", present at the Council of Rome (313) is claimed by Sienna as its first bishop, also by other cities of Italy. The first bishop of certain date was Eusebius (465). 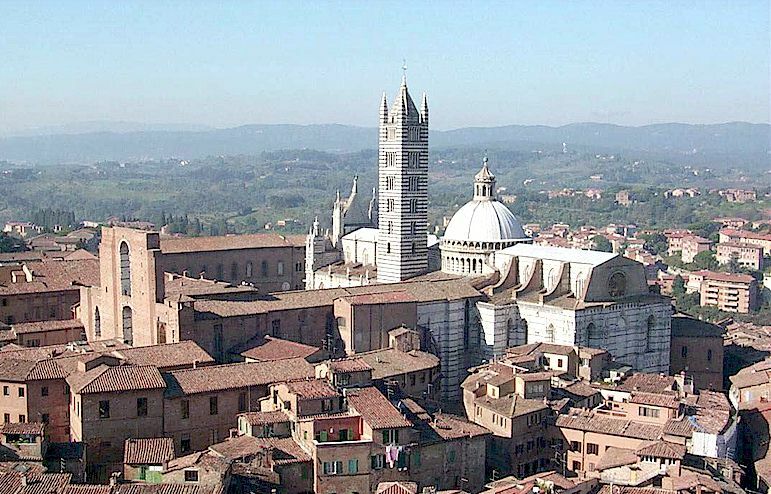 The Lombard invasion interrupted the episcopal succession in Sienna but it was restored in 635 with Bishop Maurus, when Rotharis rebuilt the city. In 713 the controversy concerning jurisdiction over certain lands between the bishops of Sienna and Arezzo commenced and lasted for three centuries (712-1029). The bishops of Sienna - Adeodatus ( 713), Ausifredus (752), Cantius (853), Lupis (881), Leo (1029) - claimed ecclesiastical authority over all the territory within the political limits of the republic. The struggle was decided in favour of Arezzo. Other Siennese bishops were Giovanni (1058), founder of the monastery of Monte Cellese, St. Rodolfo (1068), Gualfredus (1083), author and poet, Buonfiglio (1215) who opposed the heretical Patarini and reformed the clergy, Bernardo (1273) brother of B. Andrea Gallerani, founder of the hospital and brotherhood of the Misericordia (d. 1251), Ruggero di Casale, O.P. (1307), a learned theologian active against the Fraticelli, who in 1314 excommunicated the entire convent of Franciscans at Sienna, Azzolino Malavolti (1357), who obtained privileges for the University from Charles IV. In 1384 the canons exercised for the last time their right to elect the bishop, the election not being confirmed. In 1407 Gregory XII, residing in Rome, named his nephew Gabriele Condulmer as bishop, afterwards Eugene IV. Pius II, a former Bishop of Sienna (1449), made the See an Archbishopric in 1459. The first archbishop was Cardinal Francesco Nanni Todeschini Piccolomini (afterwards Pius III), succeeded in 1503 by his nephew Cardinal Giovanni Todeschini. Francesco Brandini held the See from 1529 to 1588, Francesco M. Targui (1597), reformer and friend of St. Philip Neri, was bishop in 1597, Metello Bichi founded the seminary in 1613. Alessandro Petrucci (1615), emulating St. Charles Borromeo, was active in reforming the convents of women. Leonardo Marsili (1684) was much opposed by the comune and by the Grand Duke of Tuscany. Cardinal Felice Zondadari (1795-1823) suffered exile in France in 1809; Enrico Bindi (1871) was a man of letters. The suffragans of Siena are Chiusi and Pienza, Grosseto, Massa Marittima, Sovana, and Pitigliano. It was decreed in the Council of Constance that five years later another council should be called. In fact Martin V summoned it for Pavia, where it was inaugurated on 23 April, 1423. The general session had not yet begun when the plague broke out at Pavia, for which reason the transfer of the Council to Sienna was decreed. The procedure of the Council was almost identical with that at Constance. Certain formalities of safe conduct issued by the city for the members of the Council were the cause of friction with the Pope. On 8 November, four decrees were published: against the Hussites and the Wyclifites; against those who continued the schism of Benedict XIII; on the postponement of the negotiation with the Greek schismatics, and on greater vigilance against heresy. Gallican proposals of reform produced discord with the French. On 19 February, 1424, Basle was selected as the place of the next Council. On 20 February, the dissolution of the Council was decreed, but the Decree was not published until 7 March. The French would have preferred to continue the Council until the "reform" of the church "in capite et in membris" (in its head and its limbs) had been accomplished, but whether to avoid a new schism, or on account of fear of the pope (since Sienna was too near the Papal States), they departed. The magistrates of Sienna took care not to let anyone depart until he had paid his debts. During your tour of the art cities of Tuscany, visit and stay in the Chianti countryside! Beautiful scenery, inexpensive food and wine, less-frequented art and architecture, authentic people. The Alta Maremma is a large and diverse area southwest of Siena, encompassing the Tyrrhenian seashore, coastal plains and inland hill towns. Click here to learn about the Maremma seaside, hot springs, nature reserves, Etruscan remains and great places to stay in Tuscany. Sienna Italy © ammonet InfoTech 2005 - 2018 All rights reserved.